Jim and Bill Brewster led Banff’s first paying guests into the backcountry of Banff National Park on horseback more than 100 years ago. Today visitors are still able to enjoy the park on this traditional form of transportation. Crossing the Spray River on a Warner Guiding horseback ride. around the Marsh Loop ($48). A two-hour trip around the Sundance Loop ($82) departs four times daily. 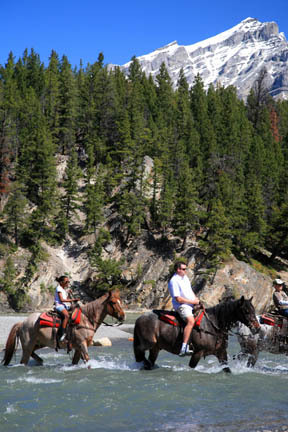 Other longer trips include the three-hour Mountain Morning Breakfast Ride, featuring a hearty breakfast along the trail (departs 9 a.m.; $120); Explorer Day Ride, a seven-hour ride up the lower slopes of Sulphur Mountain (departs 9 a.m.; $230); and the Evening Steak Fry, a three-hour ride with a suitably western steak and baked bean dinner along the trail (departs 5 p.m.; $115). In addition to day trips, Warner runs a variety of overnight rides that include lodgings in backcountry lodges or tent camps. The main accommodation is Sundance Lodge, an easy 18-kilometer (10-mile) ride, which has 10 rooms, a large living area, and even hot showers. The shortest option is an overnight trip departing Saturday through summer for $625 per person. A three-day trip is $898. Four-day ($1,200) and five-day ($1,515) trips split their time between Sundance Lodge and Halfway Lodge, which is farther up the Spray Valley. Rates include horse rental, all meals, and accommodation.